Shadows and Illuminations w/ east coast model, Karli Urban! Hey, Steemit! Pleasant evening to all of you. We’re all settling in at home for @bonni’s last night visiting the Twin Cities. It’s been great having her here. We all went out for a big dinner at the Cheesecake Factory to celebrate. It was days like this that I realize the blockchain revolution isn’t just a “phrase”. It’s real and I’m endlessly grateful to be a part of it. Being able to pay for a dinner of ten loved ones, without grimacing when everyone at the table decides to order desserts; those are the kind of changes I’ve felt most in my life. Tonight’s photography is part of the final edits I’m working on for “Dark Pinup”. New edits of a beautiful model I photographed in October of last year in my hometown of Scranton, PA. Her name is Karli and she’d originally booked a shoot with me years ago. She was in a serious accident and had a long, arduous recovery. Afterwards, in an effort to reclaim her indemnity, she contacted me about shooting in the comics months. The original plan was that Karli was to meet me in Minneapolis on a drive from Scranton, to her new home on the west coast. Life got in the way and due to family interferences, she wasn’t able to make the move […as someone that lived in Scranton his whole life, who finally moved at 30, to immediately regret not moving at 20, I can definitely understand that anchor a small town can have on your life]. We rescheduled, but it never really happened. I was traveling so much from 2013 - 2015, our travel schedules never seemed to line up. I’m sure after a while, she started to feel I was going to abandoned her, keeping her deposit. I was busy, but I never forget about things like this. 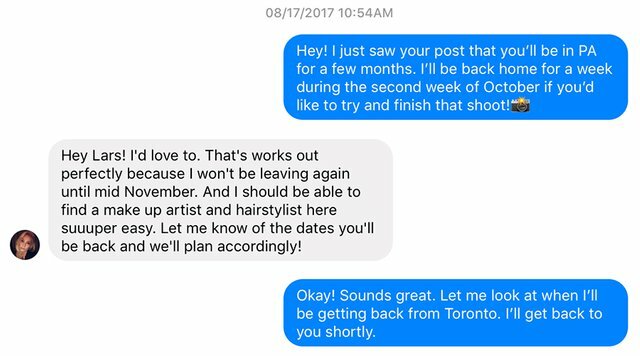 Finally, on one trip back to the east coast, I saw a few openings and messaged her on Facebook. Shortly thereafter, we had a date. We met up after years of planning. Our location was an old abandoned factory, one of many throughout Northeastern, PA. It was surrounded by fields of high grass, completely remote. It was the perfect backdrop for dark photography within the crumbling walls, but right outside in the field, we were able to making luminous, bohemian images that shaped her body through the grass. What a perfect contrast, all within the same location. Thanks for reading! For more photography, art, illustration and the stories behind the work, follow me here @kommienezuspadt. Have you ever read the novel, "Dune"? For some reason these photos, and @bonni really exemplify the Bene Gesserit to me. Again I have been surprised by the quality of the photos. The model in turn is beautiful and fits well on stage. I hope to continue enjoying your photos. @dezconocido always grateful for the support, man! Amazing pictures, and love the location! It’s amazing how interestingly contrasting NEPA can be. Thanks @lakeshorebrewery! Yeah, I used to shoot in the Ashley coal breaker a lot and one of my last trips I realized they tore it down. So sad. Very sad. There are still a few great places left, but unfortunately they are tearing many down. Thanks for all the kind words @aice20! I love that Adobe Bridge gives you the ability to manipulate those shadows and highlights before developing an image for Photoshop. Stunning work as always. I love reading the stories behind shoots. I think I'll try to include more of this kinda info in my own blog posts. Thanks @condra. Yeah, I personally love writing the stories to accompany the photos because most of the time, I'm so busy I hardly remember the details. Writing Steemit blogs gives me a chance to relive those shoots. I too live in an area with a lot of abandoned factories, and all the local photographers are always doing shoots there with their models. So your "abandoned industry" scenes are nothing new to me. That said, the tall, overgrown grass + model picture is fresh and exciting. I love the contrast between the brown vegetation and the bold colors of the lingerie. Great work, and inspiring for me. Cheers! Oh man that top shot....holy crap thats beautiful!! They all are, but that one just left my jaw on the flood as I was scrolling through my feed. Thanks @davekavanagh! Actually, I really like that first one, too. I wasn't sure how it'd go over with others, especially up against the others.